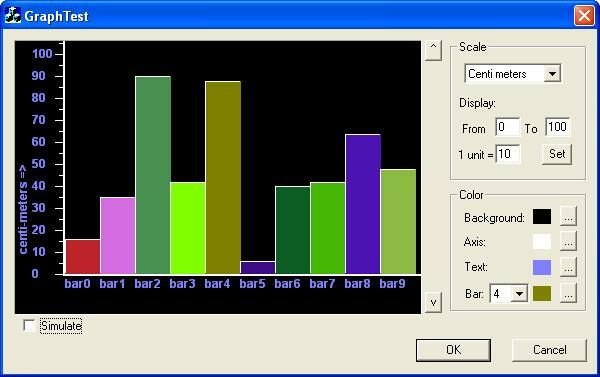 Here is a simple bar graph control class derived from CStatic. It supports displaying real-time data, using any number of bars with different colors, using a scale, both in centimeter and inch, etc. The code uses optimized plotting without flickering. We can change the background color, the text color, the bar color etc., change the scale, and change the display area. Copy the files GraphCtrl.h and GraphCtrl.cpp to your project directory, and add to your project. Include GraphCtrl.h in files where you need to use this class. Change CStatic definitions to CGraphCtrl. Use the functions described below. void SetUnit(CString pUnit); - Sets the unit type string to be displayed near the Y axis. void SetScale(int); - Sets the value of one unit in Y axis. int GetScale(); - Returns the current scale value. int AddBar(int iVal, COLORREF bClr, const char* sLabel); - Adds a new bar to the right end. bClr is the bar color and sLabel is the string to be displayed under the bar. int InsertBar(int index,int iVal, COLORREF bClr, const char* sLabel); - Inserts a new bar at a position. int DeleteBar(int index); - Deletes a bar. void SetBarValue(int index, int iVal, BOOL bDraw=TRUE); - Sets the value of a bar. void SetBarColor(int, COLORREF, BOOL bDraw=TRUE); - Sets the color of a bar. int GetBarValue(int iIndex); - Returns the value of the bar at a position. COLORREF GetBarColor(int iIndex); - Returns the color value of a bar at a position. void SetBGColor(COLORREF clr); - Sets the background color of the graph. COLORREF GetBGColor(); - Return the background color of the graph. void SetAxisColor(COLORREF); - Sets the color of the axis lines in the graph. COLORREF GetAxisColor(); - Returns the axis color. void SetTextColor(COLORREF); - Sets the text color. int GetNumberOfBars(); - Returns the number of bars. int DrawGraph(void); - Draws the graph. int SetDisplayRange(int iRangeStart, int iRangeEnd); - Sets the display range of the Y axis. void GetDisplayRange(int& iRangeStart, int& iRangeEnd); - Gets the display range of the Y axis.